Founded in 1902, Southern Teachers is the oldest teacher agency in America. The history of teacher agencies in America is surprisingly interesting. The first agency was established in Boston in 1846. By the end of the nineteenth century there were dozens around the country. In the first three decades of the 20th century, the growing ubiquity of compulsory public education produced hundreds of placement firms. 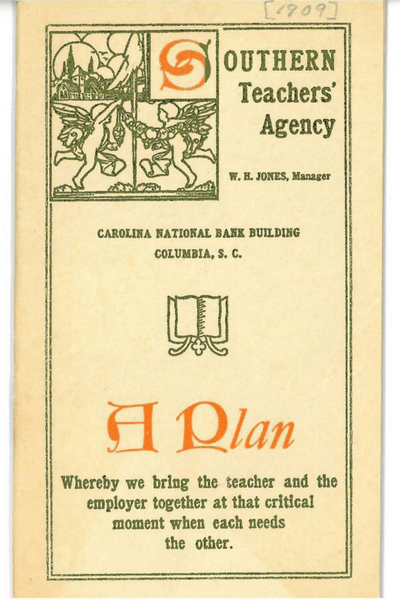 Among the leaders was Southern Teachers Agency, originally located in Columbia, SC. William Jones, Southern Teachers’ founder, was instrumental in assembling a regional association of southern agencies and then the National Association of Teachers' Agencies in 1915. With the help of his nephew, Henry Forbes, Southern Teachers expanded to include branch offices in Chattanooga, Richmond, Memphis, and Louisville. The Great Depression took a heavy toll on the teacher-placement industry, but Southern Teachers survived. In particular, the Richmond office enjoyed many years led by Susan Forbes Guess (Henry’s daughter) and her husband, Doug. When Mr. Guess died, Bob and Virginia Goodman, both career educators, bought the agency in 1981. Their son Carey assumed leadership in 1997 and moved the office to its current location in Charlottesville in 2000. Over five generations in two families, Southern Teachers has proudly served schools and educators. Though we've made changes in operations, we’ve diligently preserved the personal service that has always defined Southern Teachers. We provide a free service to candidates seeking jobs in private/independent schools. We’re the only agency dedicated to work in the South, and we’ve placed far more teachers in our region than any other service. Interested in joining our team? Visit our Careers page.